Hello, thanks for dropping by my Patreon page. I am Dr Martin Hirst a journalist, author and struggling artist. I have a background in journalism and academia and now I'm moving into freelancing. I have created this page to fund my creative projects in political writing and in pursuit of my art. As well as being a political journalist I have written eight books about journalism and I'm also studying visual art. I have a number of projects on the go and I would like you to consider sponsoring one or more of them. 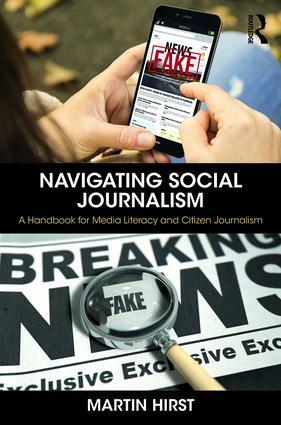 My most recent book, published in November 2018, is called Navigating Social Journalism. It is an academic book, but it's not dry. It is written in a readable style and it basically explains -- in 130,000 word -- why sites like Paetron are becoming important in a world where trust in mainstream media is falling and it's getting harder to determine what is fake news and what's accurate reporting. The subtitle is "A handbook for media literacy and citizen journalism". In a way it is a manifesto for why people like me are joining sites like this. I've also just started work on my next book, a collaboration with my friend and colleague Dr Roger Patching. We are writing about ethics and trust in the crisis-ridden world of journalism. Your contribution to my Patreon fund will help support this writing effort. I already curate a lot of content via social media, including my Twitter account Ethical Martini, a Wordpress blog, also called Ethical Martini, and six paper.li publications. The paper.li publications are currently operating without much input from me except for being populated by the various Twitter lists I manage. My first goal on Patreon is to unlock the full potential of these paper.li feeds by taking a paid account. I have written for several progressive online outlets over the past few years, but the honest truth is they cannot pay me a living wage. I am planning to syndicate my work to several of the better outlets so that it can reach a wider audience. If you'd like to support progressive journalism and help me increase the reach of my work please consider becoming a Patreon. I am a member of the Canberra Press Gallery and also the Victorian gallery in Melbourne. I would like to spend more time on political reporting and, in particular, I'd like to cover the 2019 federal election in some detail. I would like to build up a salon of Patreons to fund some travel and other expenses so that I can go on the road this year. A lot of public interest stories never get told because the smoking gun documents are hidden behind a veil of secrecy. There is only one way to peek behind this curtain and that is Freedom of Information requests. However, Freedom of Information is never free. In fact, there are huge financial costs involved in successfully releasing information from its hiding place. There is a lodgement fee of between $30 and $50 for each request and then there's the cost of actually having the request processed which can reach into the hundreds of dollars. I am currently funding my own FOI requests, but I sure could use some help. If you'd like to support my Freedom to Investigate, consider becoming a Patreon. I am an established writer when it comes to political commentary. I can write 100s of 1000s of words that are insightful and entertaining. I write with wit, intelligence and humour and I can do it all day. The problem is, I have to pay my bills. OK, so I'm no Van Gogh, but I do have a garret studio and I think I'd make a good Impressionist. My patreons will be rewarded with a selection from my extensive catalogue of original linocut prints, drawings and paintings, and for the right price you can even commission a work. A dollar a word is the gold standard for freelance payments. Democracy dies in darkness. Help shine a light into the corners.